Sample Presentation on Family-work conflict. • Why is the research important? The research is important because as both parents take on more family responsibility, they need to effectively balance family life and work. Many face FRD on a regular basis, so they are not only denied equal treatment and various opportunities, but also experience emotional exhaustion and stress. Clearly, researchers sought to understand the problem in order to make it publicly known and ultimately develop ways to benefit employees and employers in legal and non-discriminatory ways. The authors used conservation of resources theory, which argued that “resources that are valued and not provided in the work context deplete emotional energies and ultimately trigger work–life conflict.”. Men, who hold high power distance and perceive family responsibility discrimination at work and women who hold high or low power distance and perceive family responsibility discrimination at work, showed “increased emotional exhaustion and work–life conflict” (Trzebiatowski& Triana, 2). They quoted many other theories that showed how discrimination and specifically FRD, limited opportunities, created stress, disgruntled, unmotivated and unproductive employees. The authors also used Social Role theory, which hinted that since women still appear to dedicate more time to family in addition to work, they may be more affected by FRD than men (Trzebiatowski& Triana, 4). I personally remember, how my mother could not get any promotion in brand management and marketing because the employers believed she’d be more concerned with her family, thinking about her children than about her work. Since, promotion leads to more responsibilities, which would require my mom’s time, the employer believed she would not be willing to progressively dedicate more time to work. To avoid any accusations of discrimination, and to make my mom formally skip the opportunity, the employer deliberately put in the job description willingness for weekly business trips. Clearly, when the other person got promoted, they made only 2 trips a year. 1b. Perceived FRD will be positively correlated with work-life conflict. 2a. Positive correlation between FRD and emotional exhaustion will be stronger for women than for men. 2b. The positive relationship between FRD and work-life conflict will be stronger for men than for men. (Trzebiatowski& Triana, 4). 3. 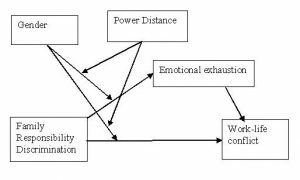 The effect of perceived FRD on emotional exhaustion and work-life conflict will be stronger for women, regardless of power distance, while for men who score high on power distance, compared to men who score low on power distance. 4. 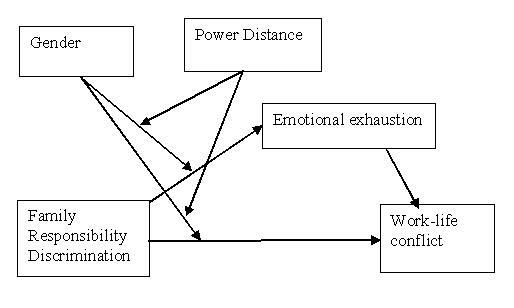 Perceived FRD relates to work-life conflict through emotional exhaustion. • Independent variables: discrimination in the workplace, i.e. FRD. Variable collected by asking the participants to take a questionnaire that examines perceived age discrimination, yet substitute “age” for “family responsibility” to understand that discrimination takes place (Trzebiatowski& Triana, 6). For emotional exhaustion, the Maslach Burnout Inventory was used (Trzebiatowski& Triana, 6). For work-life conflict variable, the Work Interference With Family Scale (Gutek et al. 1991) was used (Trzebiatowski& Triana, 6). • Moderating variable: male or female gender, power distance(Trzebiatowski& Triana, 6). For gender variable the researchers relied on personal response. For power distance variable, they used Maznevski and DiStefano’s (1995) scale (Trzebiatowski& Triana, 6). We turned the transcript into a presentation, so watch Family-work conflict presentation online! Posted in psychology, Sample paper and tagged presentation, slides, tutorial.